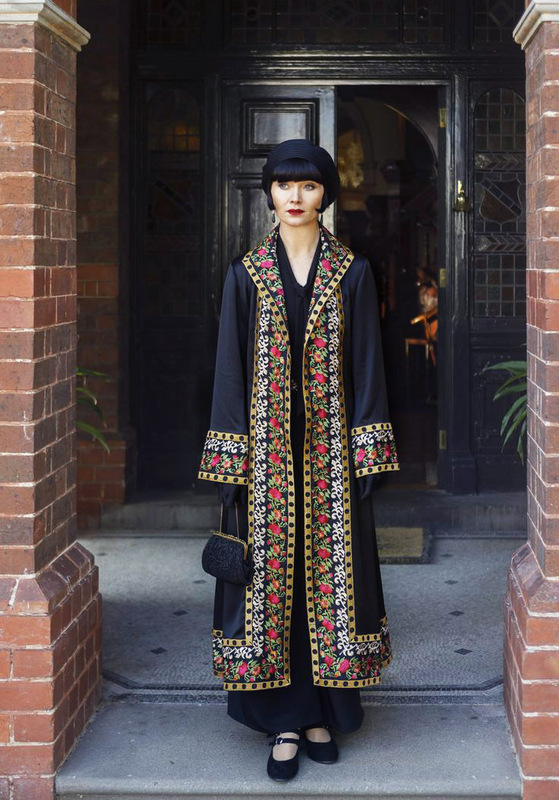 Have you seen Miss Fisher's Murder Mysteries? It's an Australian TV show based on the Kerry Greenwood Novels. The series highlights the Honorable Miss Fryne Fisher, who is a lady detective in the 1920's, and is played by the brilliant actress, Essie Davis. TheFryne character is the epitome of the strong, sassy, smart woman that I would love to be. AND she has a fantastic wardrobe. The show is fast, fun and well filmed. I highly recommend. You can stream it on Netflix or catch it when it airs on PBS. Over the 3 seasons that have aired so far, Fryne's clothes continue to inspire and seduce me. She's got a hat, gloves and coat for every ensemble. The workmanship and design of the clothing are amazing. You can tell by the drape of each piece that it's been custom made for it's wearer. Costume designer, Marion Boyce has truly outdone herself, creating a wardrobe for this dazzling character. I've been so enthralled, that in re-watching the series, I've taken to sketching some of the more wearable outfits and, in turn, thinking about how to reproduce some of Fryne's looks. Sketch of her Rose Colored Velvet Duster from Season 3. It has rounded and flared Godets on either side and deep slits in the underarm that reveal the lining. Here is a study of one of Fryne's outfits, were I've seen a basic shape, but did variations on the details (side to side). I find that I'm drawn most to the wide leg pants that she wears throughout the seasons; maybe in season 3 more than the others. The act of wearing pants really emphasizes her bold character and independence. It wasn't common for women to wear pants until the 1940's, so doing so really meant that she was a woman of her own mind. I've made a pattern for these wide leg pants and now have two pairs - one in black and one in beige. Right now, I'm working on a blouse that will be similar to the blouse in my sketch. I found a Vintage Pattern Lending Library pattern for a dress and have made my blouse from it. 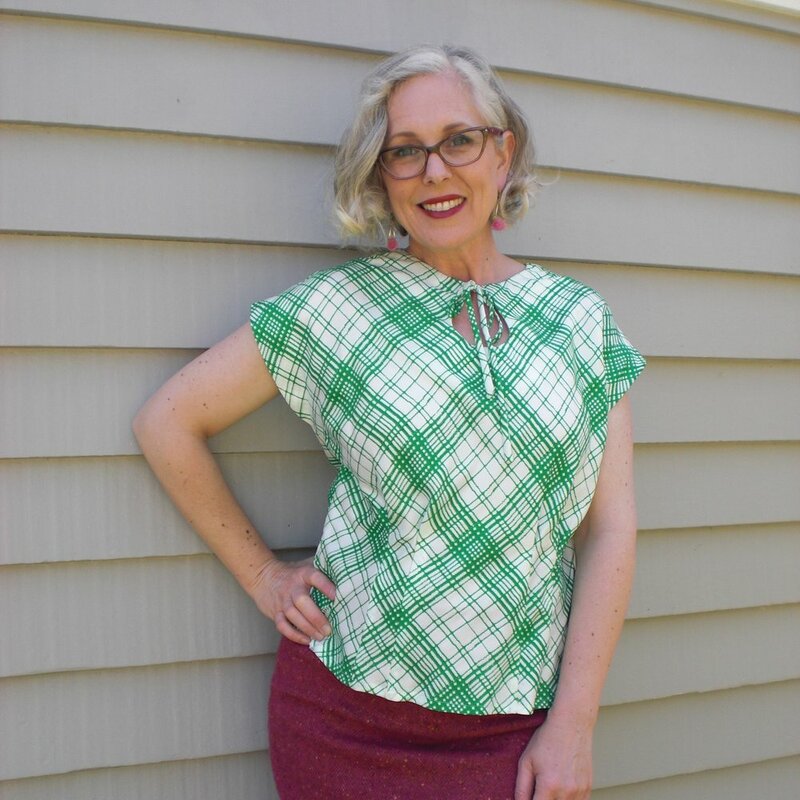 This is the blouse I'm making from the VPLL pattern. It still needs sleeves. and here is a dress from 15 years ago (my design) and the VPLL straight coat I made earlier this year. I think I really achieved the look by coordinating my hat and Chinese jacket, wide leg pants and pink fur at the Hat's Off to Strong, Smart & Bold Women's Who Dare Event - A fundraiser for Girl's Inc of the Island City. Here I am in the powder room at the Oakland Scottish Rite - The venue (not in the powder room of course) for the Girl's Inc. event. 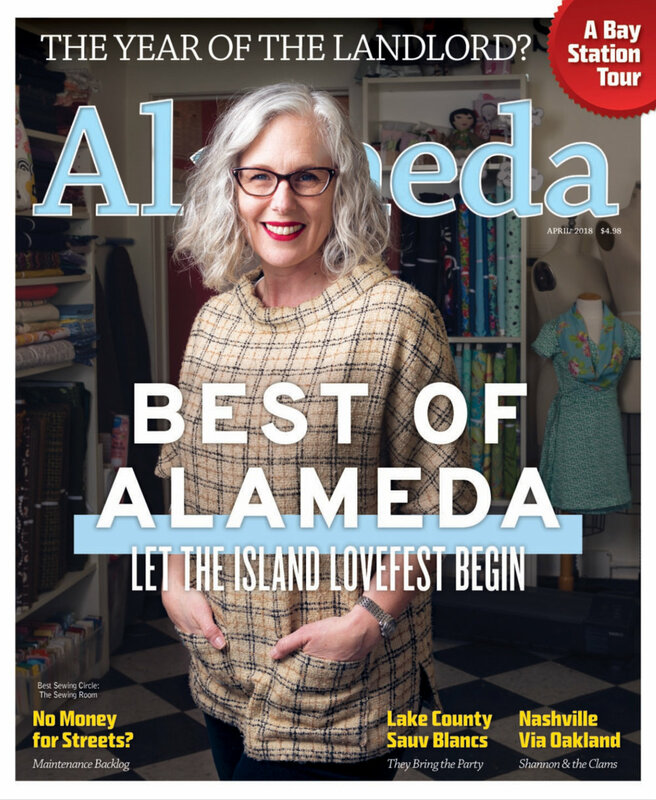 Miss Fisher wears the embroidered coat quite well and I've been surprised to find a few recently at the Alameda Point Vintage Fashion Fair and also at the Alameda Point Antique Fair. Here I am with my new (to me) vintage embroidered coat and hat, trying on a coordinating scarf. This embroidered coat came from the Vintage Fair at Alameda Point last fall. Vintage Joan & David shoes, also from the Antique Fair. They are likely from the 1980's but have the right look and are so comfy. Now it's time for me to finish that blouse. Keep an eye out for a post about fitting the embroidered jacket (red/orange/green above). Until next time - Happy Sewing!